Not all Mondays are meatless at the Mesquita-Sullivan household, but when they are, they’d better be good. So last Monday I surprised my husband with these Veggie Pub Sliders but “forgot” to mention they were meatless. I used the Gardein Crispy Chick’n Sliders – that are made with plant protein but mimic chicken – as a base and he ate it without any clue it wasn’t real chicken. You should’ve seen the face of my meat-lover-macho-man husband when I told him the sliders were meat free! Priceless! I don’t usually use frozen food, mostly because I like cooking with fresh ingredients, but this time it was a blessing! Not to mention the sliders don’t taste like they were frozen. Not even the buns! Shockers! 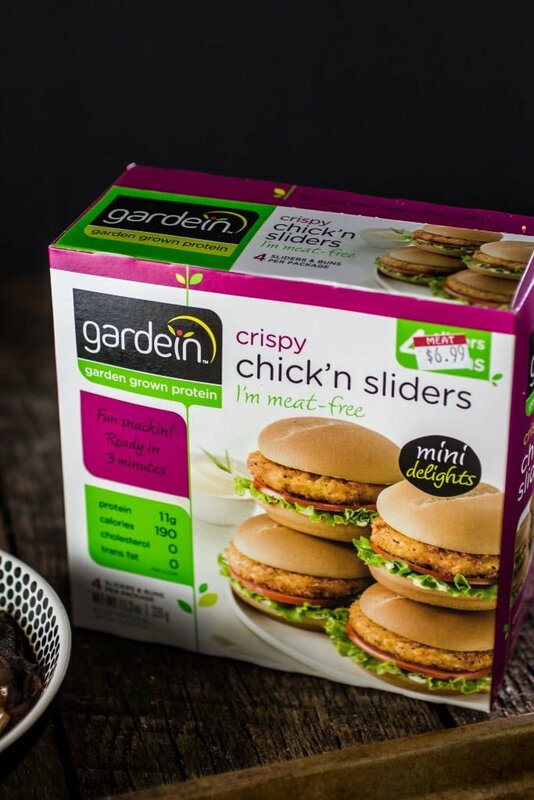 Gardein (garden + protein) is a plant protein brand offering a variety of delicious, convenient and versatile foods. It tastes good, is good for you and good for the planet. Yay, planet! The folks at Gardein create delicious, center-of-plate foods people love that deliver the taste, texture and nutrition of meat – with no cholesterol and less fat and calories. Also, their winning products are made from non-GMO soy and wheat, ancient grains and veggies. If you’d like additional information and chef inspired recipes, please visit their website here. The veggie sliders are so good, they can be consumed as is. However, I wanted to pump them up a little bit and decided to give them a pub make-over. I caramelized some onions with Guinness beer and made a vegan olive tapenade. Then I added some smoked provolone – that can be left out for a vegan version! – broiled the sliders until the cheese was melted and dinner was on the table in less than 30 minutes! I don’t know, friends, but this experiment was so successful I might start making Meatless Monday a thing in our home. I actually read that if every American ate meatless just 1 day a week for a year, it would be the equivalent of taking 1/2 million cars off the road. That alone should be enough to convince my carnivorous husband. And then I might throw in the conversation the fact that reducing meat intake just 1 day a week can have a considerable positive impact on our healths. It increases life expectancy while reducing the risk of heart disease, cancer, obesity and diabetes. I’m sold! The Gardein peeps are so nice, they are giving you a $1 off coupon to encourage you to try their product! But before you go on putting your shoes to run to the store, don’t forget to print the recipe so you can get the other ingredients too! 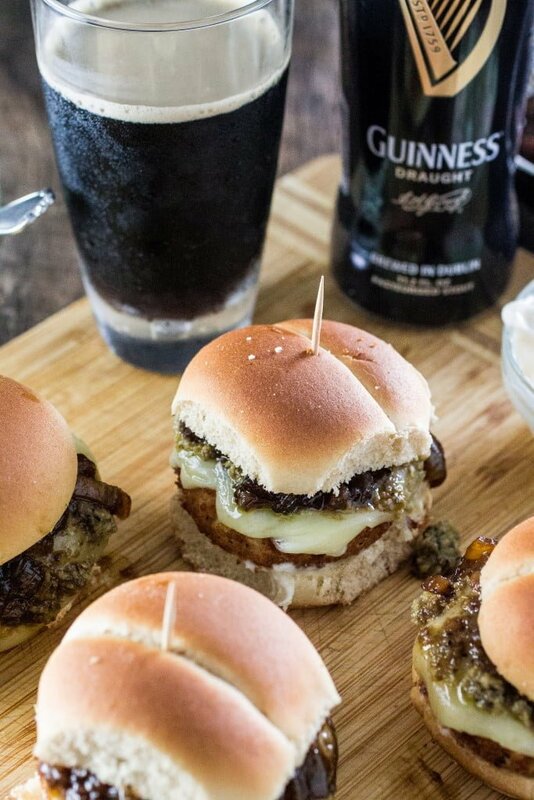 :) You will be feeling like the coolest kid in town for having a Meatless Monday night that also involve a pub style recipe with Guinness in it. I bet your Monday nights were never this wild! In a large skillet, over medium low heat, heat the olive oil and sauté the onions, stirring occasionally, until they start browning. Add the beer and the brown sugar and cook until thickened and reduced by less than half, about 20 minutes. Reserve. Process the ingredients in a food processor until the desired consistency. I like mine smooth. Reserve. Assemble patties on a baking sheet sprayed with non stick cooking spray and bake them for 15 minutes, flipping them over halfway, until they are crispy. During the last 3 minutes of cooking time, add the buns to the oven to toast. Take the patties and buns out of the oven. Turn the broil on, top the patties with the provolone cheese (if using) and pop them back in the oven until the cheese melts, about 2 minutes. Lightly brush the bottom buns with mayo (if using) and then top with lettuce, the patties, a little olive tapenade and the caramelized onions. Add the top buns and serve! 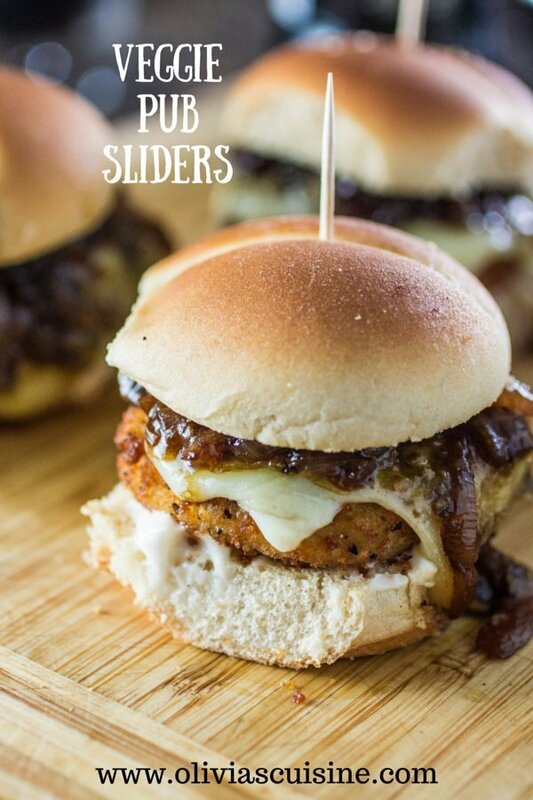 These sliders look juicy and delicious! Love them! And I need to try Gardein, sounds like the perfect choice when you are short on time. I will really try this recipe, Olivia! It looks delicious indeed!!!! This looks perfect to make when you are running short of time! I need to try! Delicious! Your photography skills are amazing! I totally want this and I almost never eat veggie burgers! I love the sliders just as they come, but I really want to try your versions n. They look delicious! 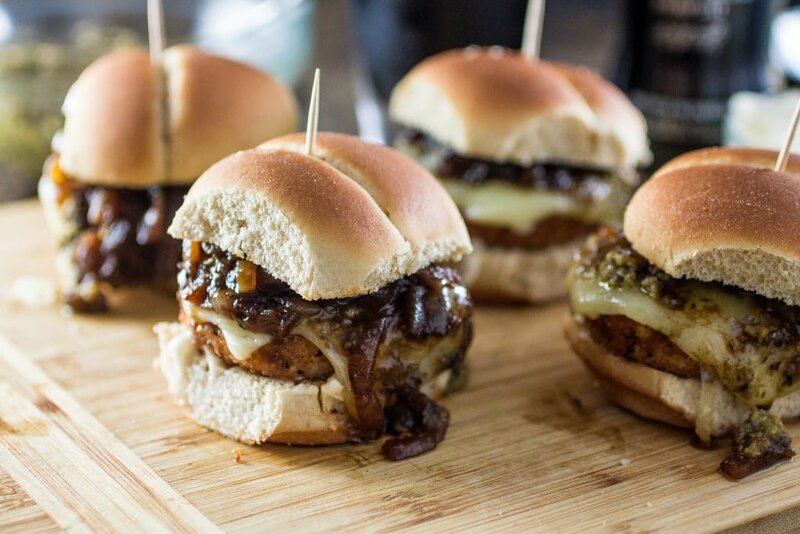 It’s hard to believe these sliders are meat-free! They look SO delicious and I can definitely see myself devouring many. Oh my goodness! 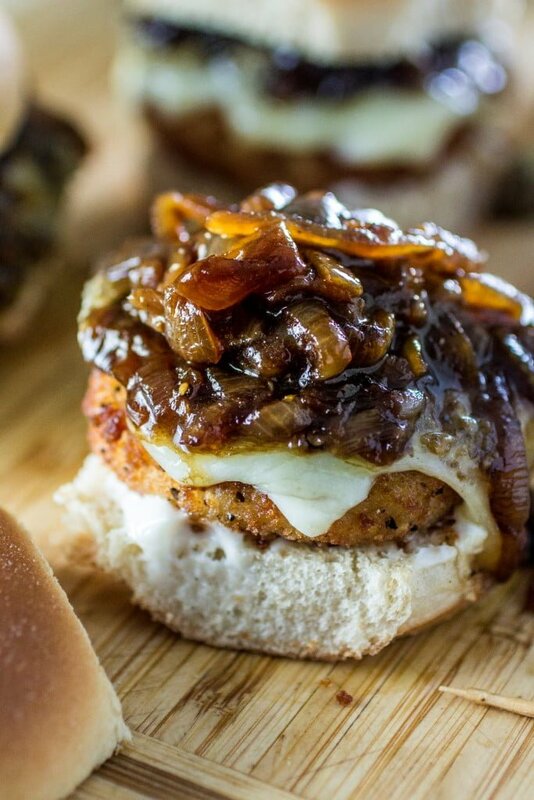 The caramelized onions make all the difference in the world! Yum! My main reason for steering away from the sliders was because I was worried the buns would taste weird after being frozen… good to know they don’t! I will have to give them a try. I was surprised too! But they taste just fine! :) Thanks, Laura! These burgers look perfect, Olivia! The caramelized onions have made them look even more tempting. No one would believe these are meatless! These sliders look fantastic! And the caramelized onions—AMAZING! 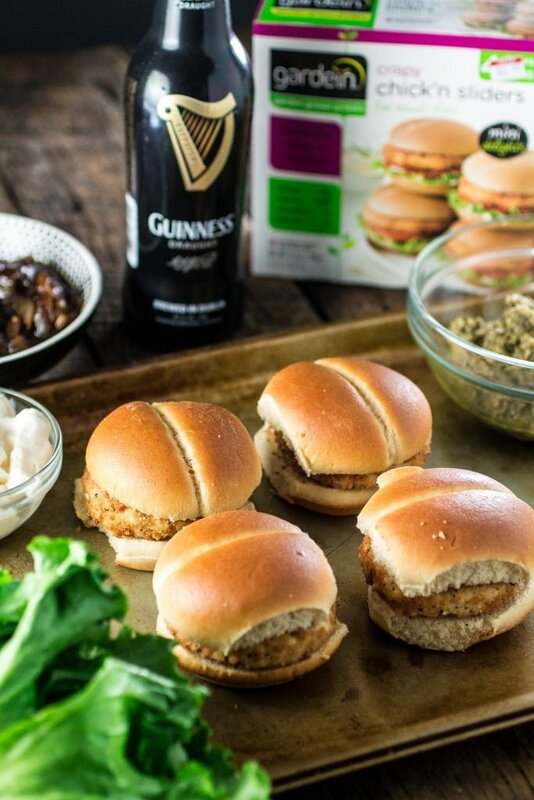 I’l have to keep an eye out for these veggie sliders in the store.